P1 can map your routes and show run stats like distance, duration and pace.No phone required! 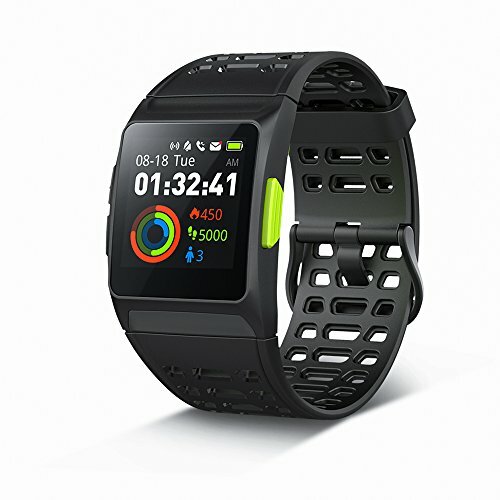 P1 can record real-time heart rate, exercise duration, distance automatically. What's more, there are 17 kinds of sports you can choose,such as cycling,yoga etc. 【Born for Running】7 different running modes available in P1. There are freestyle, distance mode, duration mode, energy mode, fat burning, endurance and CPET. Make the most of each workout. 【Built-in GPS】P1 can receive GPS satellite signal, the deviation is less than 3 meters, not only show your optimal speed and average speed, but also the maximum pace rate and average pace. 【24/7 Heart Rate Monitor】During workouts, Dynamic Heart Rate Monitoring helps check your real-time heart rate to see whether you're in the Fat Burn, Cardio or Peak zone. P1 is equipped with HRV Analysis, indicating your fatigue state, effectively preventing sports injuries and ensuring workout safety. 【Updated Display】1.3 inches, high-resolution color touch screen You can clearly see the screen whether you are under bright sunshine or in a dark room. 【Various Personalized Watch Dials】 9 different dials with your steps, calorie burn, heart rate, missed calls and messages. If you have any questions about this product by IWF, contact us by completing and submitting the form below. If you are looking for a specif part number, please include it with your message.